Raised bogs are only recieving rainwater with a very low concentration of nutrients. Only a few species of plants and mosses can survive under these conditions. 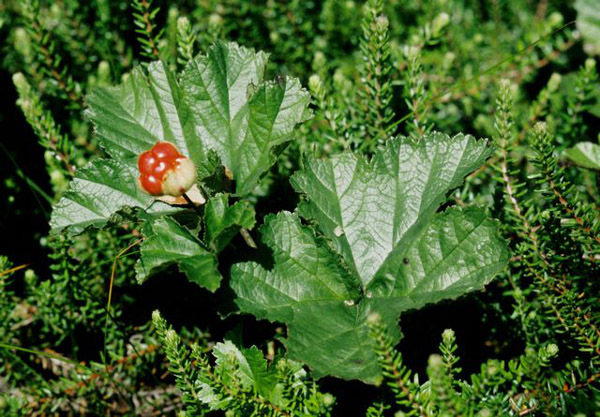 Rubus chamaemorus (left picture) is widely distributed in the scandinavian bogs and oligotrophic fens but is very rare in Denmark. It is common in Lille Vildmose and has only a few other sites in northern Jutland and nothern Seeland. R. chamaemorus is growing on the hillocks of the bog surface together with Calluna vulgaris, Erica tetralix, Andromeda polifolia, Empetrum nigrum, Vaccinium oxycoccus, Trichophorum caespitosum (picture below), Eriophorum angustifolium and E. vaginatum. Together with these few species of plants only some species of bog-mosses are common as Sphagnum magellanicum and S. rubellum. 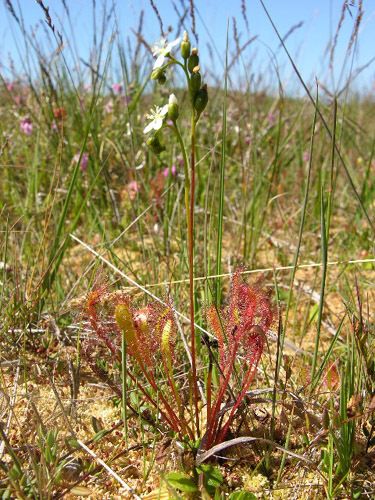 In the wet dips in the bog grow species as Rhynchospora alba, Drosera rotundifolia, D. inermedia and D. anglica (left picture) together with Sphagnum cuspidatum. 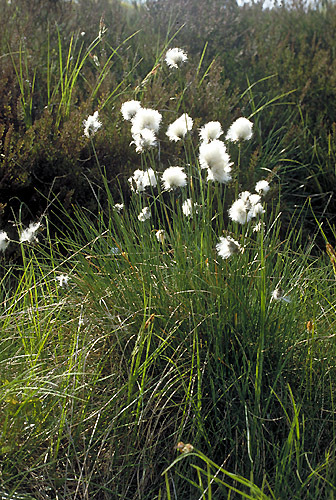 Only a few other species of higher plants can be found in the undisturbed bog eg. Carex limosa and Betula pubescens. Where the bog is disturbed fx. along animal tracks over the bog surface other more nutrient-demanding species can be found eg. Molinia caerulea and Dryopteris carthusiana. Along the borders of the raised bog the ground water has some influence. This zone is called the lagg. Here more demanding species can be found as Betula pubescens, Molinia caerulea, Carex nigra, Vaccinium uliginosum etc. Back to Raised bogs in Himmerland.